Parking Lot Services offers a comprehensive range of services for asphalt paving in New Jersey. Serving commercial establishments throughout the state, our professional team of contractors consistently delivers excellent results for your pavement. Pavements gradually deteriorate due to heavy vehicle traffic, lack of maintenance, and adverse weather conditions. This causes the surface to crack, loosen, and dislodge, creating a pothole. The pothole may eventually get bigger with heavy loads and low temperatures and as the asphalt wears off. Potholes filled with water have a greater tendency to expand, as the water erodes the loose chunks of pavement. Potholes may further increase in size during rainy season because more moisture can weaken the susceptible(weakened) asphalt and cause additional damage. Without immediate repair, potholes can worsen and sections have to be removed. Timely repair saves you money. Potholes in Your Lot? We Got Them Covered! Property owners should call professional asphalt contractors at the first sign of cracks. Parking Lot Services offers crack filling, and pothole patching and repair to restore your pavement to excellent condition. Our contractors accurately measure the depth, width, and density of cracks and the size of hole to determine the procedures they need to perform to restore your pavement. We use only topnotch materials and equipment for asphalt paving in NJ to ensure durability and lasting quality. We know potholes are a nuisance, greatly affecting the convenience and safety of your customers. Our crews patch and repair no matter how big or dense the pothole. A dense network of potholes may require mill and paving. This produces a better looking and longer lasting repair. We thoroughly inspect your property, making sure we identify and budget for appropriately repair all affected areas. Parking Lot Services handles small to large scale projects for commercial establishments throughout New Jersey, including shopping centers, hotels, healthcare practices, and schools. In all such major projects, we demonstrate that we never compromise quality. Call the Pavement Service Experts! Parking Lot Services works to achieve superior results. We guarantee the safety of your customers and minimize disruption of your operations, while also making sure that our workmanship enhances curb appeal. With us, you can rest assured that your pavement will not yield prematurely to tough environmental and operating conditions, and that it’s a pleasant sight for you and your customers. Call Parking Lot Services today for an assessment and estimate for pothole patching and repair. We will create a customized project plan to completely restore your pavement. Entrust your pothole repairs and asphalt patching to the experts on all aspects of asphalt paving in New Jersey. 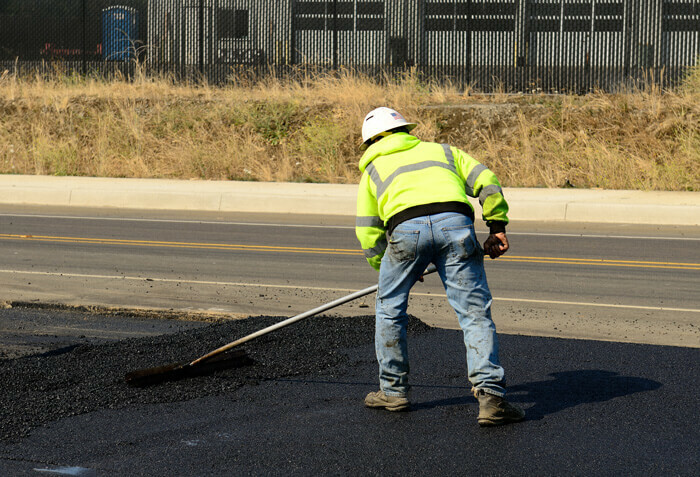 We want an opportunity to demonstrate our professionalism with our evaluation and proposal, and then our implementation of the asphalt patching, pothole repair or any other paving services you hired us to do. Our goal is to create such a high level of satisfaction that you will rely on us for all your asphalt paving and related services needs for many years to come.